Police have a duty to uphold the law and to protect the citizens of their town or city. When did this duty of theirs allow them to break the very laws that they are bound to uphold and enforce? On Saturday, August 9 2014, 11:48 AM, an officer in Ferguson, Missouri responds to the call of a sick person. At 11:51 AM, another call comes in about a robbery at a nearby convenience store. The dispatcher gives a description of the robber and informs the police that the suspect is walking toward the "Quick Trip" convenience store. At 12:01 PM, the officer encounters Michael Brown and a friend as they walk down the street. The encounter lead to Michael Brown being shot and killed. Brown had no criminal background. Soon afterwards, a second officer and supervisor arrive at the scene. An ambulance responding to the aforementioned call about the sick person drives by and proceeds to make contact with Brown. It was then determined that the 18-year-old was unarmed at the time that he was killed. The next morning, St. Louis County police chief Joe Belmar speaks at a news conference where he says that Brown physically assaulted the officer and during a struggle between Brown and the officer, Brown reached for the officer's gun. One shot was fired followed by other gunshots outside of the car. A candle vigil is held the night after his murder that later turns violent. Businesses are vandalized and looted. More than 30 individuals are arrested and two officers suffer injuries. Two days after the murder, police say they were receiving death treats. 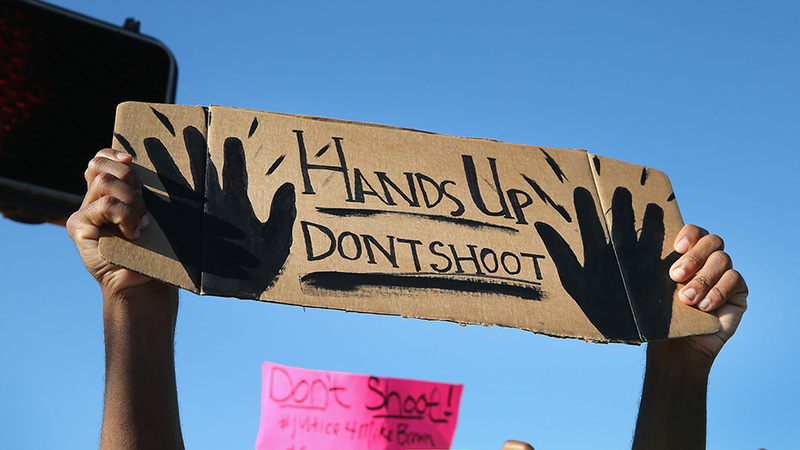 Hundreds gather outside the Ferguson Police Department to demand justice for Brown’s death. Police arrest at least 7 people. The FBI announces the agency will do a parallel investigation into the shooting. The parents of Michael Brown hold a press conference with their attorney Benjamin Crump (who also worked on the Treyvon Martin case) where they ask for the violence to stop and demanded justice for their son. The violence doesn’t stop however, and later that day police use tear gas to disperse protesting crowds. They did not release the name of the officer who shot and killed Michael Brown due to threats on social media. On the morning of August 12th, peaceful protesters gather at the county police department headquarters with a list of demands relating to the investigation of the shooting. On Tuesday afternoon, the autopsy on Michael Brown is released. The Federal Aviation Administration (FAA) announces that law enforcement helicopters will be hovering over Ferguson. That night tensions arise between protesters and police for the third consecutive night. Brown’s friend Dorian Johnson comes forward as an eye witness at Brown’s shooting. He says the officer approached them very aggressively and that Brown never attempted to reach for the officer’s weapon. He says he has no idea why they were being targeted by the officer. On Wednesday afternoon, Brown’s remains were turned over to his family. Afterwards, the Justice Department opens a federal civil rights investigation as a result of the shooting. Police begin to detain reporters as well. Police officers continue to be injured and residents arrested as tensions remain heightened as the days go on. President Obama addressed the nation and called on local police to be “open and transparent” about the investigation. On August 14th, the Missouri Highway Patrol took control over security in Ferguson. Silent vigils were held to honor Brown all over the country. No violence took place the first night the highway patrol took over. Friday, August 15th, Darren Wilson is named as the officer who shot and killed Brown. Wilson has been on the force for 6 years and has no history of negative disciplinary actions against him. An attorney for Dorian Johnson (eyewitness to the shooting) says that Dorian Johnson and Michael Brown were part of the robbery prior to the shooting. Officer Wilson claims he didn’t know Brown was part of the robbery and simply stopped Brown and Johnson for walking in the middle of the street. Violent protests and fights continue from Friday night to Saturday morning in which rocks are thrown at officers and officers fight back with tear gas. Governor Nixon issues a state of emergency for the Ferguson area. Early Sunday morning, protesters clashed once again with police under a haze of tear gas. The autopsy requested by the family showed that Brown was shot in the right arm four times and twice in the face. Monday, August 18th, Governor Nixon orders the National Guard into Ferguson after a protester shot at a police officer, residents looted local businesses, carried out a coordinate attempt to block roads, and overrun the police’s command center. In my opinion the protesters are only making the situation worse because it is making it harder to fin justice for Brown. President Obama announces he is sending Attorney General Eric Holder to monitor the unrest in Ferguson. Trayvon Martin’s mom, Sybrina Fulton, wrote a letter published in TIME magazine to the family of Michael Brown. The letter states that she wishes she could say “it will be alright”, but all she can do is pray for justice. The fights between police and protesters continue and have grown even more violent now. Four police are injured, at least two people are shot, and fires are started all over Ferguson. Michael Brown’s mother says she only looks for justice for her son. Tuesday, August 19th, a 23-year-old man was shot and killed by a police officer in North St. Louis. Officers said they were being charged at with a knife and that they had no choice but to shot. The incident didn’t appear to be related to the Ferguson riots. On Wednesday a grand jury begins investigating Darren Wilson in order to determine if he should be criminally charged for Brown’s death. Things seem to be claiming down in Ferguson. On August 24th, Michael Brown’s funeral is held outside Ferguson. Thousands of mourners line up outside a St. Louis church for Brown’s funeral. I couldn’t imagine how the Brown family must feel after weeks of what this reporter would call complete injustice. Things have calmed down in Ferguson for the time being, but no one knows if it will last. I love how you guys don’t even read the articles , you could learn a thing or two .